A contractor was redoing a garage floor for a homeowner and called Quality Concrete to deliver the concrete. We were able to back up the mobile truck to the garage and pour it directly in for the contractor and he completed the pour within one hour. Concrete Walkway In Woodbridge, NJ. Some of the areas that had to be replaced where on the side or the back of the property. The concrete was poured into wheel barrows, then carried to the areas being replaced. Quality Concrete drivers use the levers on the truck to move the chute along the area that is being poured to make sure it is covered in concrete. Quality Concrete trucks carry all the ingredients needed to make concrete. Mixing it at the job site offers more flexibility and better quality. A mason was hired to pour a driveway for a homeowner in Perth Amboy and with the weather getting colder they wanted to make sure the concrete they got was delivered fresh. The mason looked for a mobile mixer concrete truck and found us, Quality Concrete. We were able to get a truck out to them around 1 PM, the warmest part of the day, and the driveway was able to be poured with no issues even in the month of December. When Carlos needed concrete for a job he was doing at a condo association he needed to go to four different locations within the community. Carlos decided to call Quality Concrete to use their mobile concrete mixer so at each stop the concrete was fresh out of the truck. With barrel trucks the concrete is made at the plant and the concrete would have been sitting inside the barrel the entire time and slowly losing its strength. Carlos was happy with the quality of the fresh concrete and how he was able to pour each different section over a time of 3 hours and the concrete never went bad. Concrete Garage Flooring in Old bridge, NJ. A contractor in South River, NJ was pouring a garage slab in Old Bridge, NJ for one of his customers. Although the weather was still cold to deliver the concrete the job had to be completed. Quality Concrete delivered fresh concrete with accelerator to help it cure faster. The concrete was mixed right on-site, to avoid waste, making the pour cost effective. Quality Concrete delivers the right amount, right on time, so the customers don't have to worry about ordering the wrong amount. Quality Concrete made the delivery quick and easy, allowing the contractor to complete the job. The customer was extremely satisfied with his new garage floor. Concrete Pouring in Cranbury Township, NJ. A contractor doing electrical work in Cranbury Township, NJ needed to pour concrete for base poles. Searching the web, he came across the Quality Concrete website, and called to place an order. When he called, the dispatcher was able to schedule the delivery at his convenience. Customer ordered 6 yards, but the day of the delivery he only used 5 yards to complete the job. The metered trucks used by Quality Concrete mix the concrete on-site, allowing the driver to deliver the right amount on time. The customer only paid for the 5 yards that he used. Delivery was fast and efficient and the contractor was happy with the quality of the concrete, and the outstanding service provided by the Quality Concrete team. Delivering Concrete in Keyport, NJ. A contractor in Keyport, NJ was pouring a crawl space floor for one of his customers. He needed a few concrete yards delivered so he called Quality Concrete to schedule the pour. Quality Concrete is the local concrete provider for Monmouth, Middlesex, Somerset, and Union County. When the contractor called, the dispatcher booked the delivery at his convenience and provided him with the concrete prices right there and then. The day of the pour, the contractor used 5 yards instead of the 4 that he had originally ordered. The driver had an extra yard in the truck and was able to provide the contractor with the additional concrete he needed to successfully complete the job for his customer. After the pour was done, the contractor was happy with the service and his customer was very pleased with his new concrete floor. Delivering Concrete to South Amboy, NJ. A contractor in Middlesex County needed a concrete delivery to South Amboy, NJ, and was referred to Quality concrete for the pour. When he placed the call, the friendly dispatcher assisted him in calculating how much concrete he would need for the basement floor. The dispatcher also booked the contractor's delivery at his convenience and gave him all the pricing information he needed. The day before the delivery, the contractor received a confirmation call, and the day of the delivery the driver contacted him to let him know that he was on his way to the job site. When the driver arrived, he started mixing fresh concrete rite on site. The driver also assisted the contractor in making the pour run fast and smooth. After the delivery was made, the contractor remitted payment to the driver and was happy with his expertise and the service provided. Pouring Light Pole Bases In South Brunswick, NJ. A contractor in the Middlesex County area needed a concrete delivery to pour light pole bases in South Brunswick, NJ. He was looking for a local company to deliver concrete for him. He came across the Quality Concrete Website and decided to call them to schedule the delivery. When he called, he got all the pricing information he needed and booked the pour. Carlos, the Concrete Specialist, arrived to the location first thing in the morning to start the pour. He started mixing the concrete right on site. The contractor had 8 light pole bases he needed to fill. The driver was able to back up close to the bases and pour the concrete right off the truck, and no wheel barrows were needed making the pour run a little quicker. The delivery was completed in a timely manner, and the contractor was happy with the service the Quality Concrete team provided. Pouring Footings in Metuchen, NJ. A contractor in Middlesex County was looking for a concrete pour in Metuchen, NJ to do some footings. He was doing some research on the web and came across the Quality concrete website. He called the dispatcher to get some prices and book a delivery. The friendly dispatcher gave him all the information he needed and scheduled the delivery for him. Carlos, the Concrete Specialist, arrived at the job site and started to mix fresh concrete for the contractor. The contractor had to use some wheel barrows to get the concrete from the truck to the footings, and for the rest the driver was able to back up as close as possible to the footing and pour straight from the truck. Carlos delivered 6 yards of 3000 PSI mix in a timely manner. He also assisted the contractor in making the pour run a little faster. The job was successfully completed and everyone was pleased with the service provided. Delivering 3 yards Of Concrete In North Brunswick, NJ. A contractor in North Brunswick, NJ was looking to have concrete delivered for a sidewalk he was pouring. Small pours are no problem for the Quality Concrete team. The contractor called the dispatcher and scheduled a delivery to have 3 yards of concrete brought over to his job site at 8:00 am. Carlos, the Concrete Specialist, was out to make the delivery. He called the contractor before he left the yard to let him know that he was on his way to the job site. When he arrived, he began to mix fresh concrete right there and then. Carlos was able to pour right into the framed-out sidewalk, making the pour go quick and easy. After the delivery was made, the contractor was able to make a payment using his credit card. Quality Concrete drivers carry credit card swipers making in easy for customers to remit payments directly to them. Carlos handed the contractor a receipt that stated the amount that would be charged on the credit card. At the end of the delivery, the contractor was all take care of and the job was successfully completed. A team of electricians in Middlesex County was doing some electrical work in Piscataway, NJ. They were pouring light pole bases and needed a concrete delivery to get the job done. It rained a few days out of the week, so they needed to do the pour that Saturday. They had used Quality Concrete before, so they contacted their dispatcher to schedule a delivery for Saturday. The delivery was schedule for 8:00 am and Jay, the Concrete Specialist, arrived on time to start mixing fresh concrete for the electricians. They had 13 pole bases that needed to be done. Jay was able to back the truck up into each pole base, and pour the concrete straight out of the truck. No wheel barrows were needed, which made the pour go a lot quicker and more efficient. After the delivery was completed, payment was made easy for the electricians. Quality Concrete Drivers take cash, credit, and check payments making it simple for all customers to pay for their concrete. The pour was a success and the electricians were extremely pleased with the outstanding service provided by the Quality Concrete team. Delivering Concrete To Edison, NJ. A Contractor in Edison, NJ needed a concrete delivery to pour sidewalks for one of his customers. He saw a Quality Concrete truck on the road, got their number, and decided to give them a call to get some pricing and schedule a delivery. When he called, the dispatcher gave him a price over the phone and helped him book the delivery at his convenience. Jay, the Concrete Specialist, was out to make the delivery. Jay contacted the contractor the day of the delivery to let him know that he was on his way to the job site. When he arrived, the contractor had the area ready and set up to start the pour. Fresh concrete was mixed right on site, which reduces the amount of concrete waste, and makes the pour cost effective. Contractors no longer have to worry about over ordering. Jay delivered 7 yards of 4500 PSI mix. The contractor had originally ordered 10, bit since the concrete was mixed on site, the contractor only paid for the amount of concrete that he used. The delivery was a success and the contractor was very pleased with the service provided by the Quality Concrete team. A contractor in South Plainfield needed concrete delivered for a few footings. The contractor had used Quality Concrete before for a few other pours, so he contacted them again to schedule a delivery. When he called their office, the coordinator easily accessed his information and booked the delivery for the contractor. Carlos, the Concrete Specialist, was out to make the delivery. He called the contractor the day of the pour to let him know that he was on his way to the job site, and arrived on time. Carlos started making fresh concrete right on site. Wheel barrows had to be used to get the concrete from the truck to the footings, but Carlos was able to get the truck as close as possible to the footings to make it easier for the crew to get the concrete out of the truck. After the delivery was made, the contractor was able to remit payment to the driver right there and then. The job was successful completed, and the contractor was again very satisfied with the quality of the concrete and the service provided. Concrete Delivery in South Amboy, NJ. A contractor in South Amboy, NJ was in need of a concrete delivery for a sidewalk job that he was working on. He had called a few companies in the area, but he was not happy with the service and the quotes he received. Searching the web he came across the Quality Concrete website and decide to call them to get some pricing. When the contractor called their office, the friendly concrete coordinator provided him with all the pricing information he needed, and booked a delivery for him. Jay, the Concrete Specialist, was out to make the delivery. When he arrived, the contractor and his crew were ready to start pouring. Jay started mixing fresh concrete for them right at the job site offering more flexibility and quality than barrel trucks. During the delivery, Jay made suggestions to the contractor to help make the delivery be more efficient and cost effective. The contractor ordered 8 1/2 yards of concrete, but as they pour went on they realized that they were going to need less than what they ordered. At the end of the delivery, the contractor only used 7 yards of concrete, and that is the amount that he was charged for. At the end of the pour, the contractor was able to make a payment directly to the driver using his credit card, and got a receipt for it. The job was successfully completed, and the contractor was extremely happy with the service provided by the staff at Quality Concrete. Pouring Footings In Old Bridge, NJ. A contractor in Old Bridge, NJ needed a concrete delivery to pour a few footings. The contractor had used Quality Concrete before, so he contacted their office to schedule the delivery. When he called the office, the concrete coordinator easily accessed the contractor's file by using his phone number, and was able to get him on the calendar. Carlos, the Concrete Specialist, was out to make the delivery. Quality Concrete had delivered to this location before, so Carlos was familiar with the area. When he arrived at the job site the crew was ready to start the pour. Carlos was able to back up and pour the concrete right into the footings. Some wheels barrows had to be used for a few of the footings, but the concrete was still delivered in a timely manner. At the end of the pour, the contractor was able to make a payment directly to the driver using a credit card. The job was a success and the contractor was very happy with the service provided by the staff at Quality Concrete. Pouring A Foundation in Edison, NJ. A Contractor in Edison, NJ was pouring a foundation and needed about 20 yards of concrete to be delivered. He made a few calls to concrete companies in the area, and he came across Quality Concrete. When he contacted their office , he was very pleased to know that he would be able to place his concrete order in Spanish to make sure the right amount of concrete would be brought to the job site. The contractor would need two trucks to have the 20 yards delivered. He needed some time in between trucks, so the proper arrangements were made by the concrete coordinator to make sure that everything would work out just fine. Jay, the Concrete Specialist, was out to make the delivery. When he arrived at the job site, the crew working there was ready to start the pour. Jay began to mix fresh concrete right at the job site offering more flexibility and quality than barrel trucks. There were some areas that were not accessible by the concrete truck, so a few wheel barrows had to be used to get the concrete out, but everything was done in a timely manner. Since the contractor needed some time between trucks, Jay was able to drive back to the yard, reload his truck, and head back to the location with the second delivery. At the end of the pour, the contractor only used 19 yards out of the 20 that he ordered. Since the concrete was mixed right at the job site, only 19 yards were made, no concrete went to waste, and the best part is that the contractor only had to pay for the amount of concrete that was used. After all, the job was a successfully completed and the contractor was extremely happy with the outstanding service provided by the quality concrete team. Delivering Concrete In Monroe Township, NJ For Our Contracting Division. Our Contracting Division was working at a community in Monroe Township, NJ and needed some concrete delivered. To replace the driveway aprons, Quality 1st Contracting needed about 10 yards of concrete. Our Concrete Coordinator reached out to Ken, the Concrete Specialist, and provided him with the correct information to make the delivery. Ken prepped then loaded his truck to make sure everything was good to go for his pour. When he arrived at the job site, the Quality Contracting crew was ready to start the pour. They had multiple locations to do, but all the areas had been nicely framed and formed out prior to Ken arriving. The concrete was poured straight out from the truck, so they moved from one location to the other in a timely manner. Both Ken and the Contracting crew members worked together to make sure that each individual apron was properly replaced. 10 yards of 4500 PSI were successful delivered. Every driveway that had to be replaced was nicely finished. At the end of the delivery, the job was completed in a timely manner, and homeowners at the community were happy with their new driveway aprons. Small Concrete Delivery In Woodbridge Township, NJ. A contractor in Woodbridge, NJ was lokking for a small delivery of concrete to pour 4 footings. He only needed about 1 yard of concrete and was looking for a local contractor to make the delivery at an affordable price. Searching the web he came across the Quality Concrete website and decided to give them a call to get some information. When he got in touch with their office, the Concrete Coordinator provide him with all the pricing information he needed and booked the delivery for him. Sean, the Field Supervisor, was assigned the duty to make the delivery. The coordinator wrote out a ticket for him containing the address of the job site, and the amount of concrete the contractor needed. Sean loaded his truck and made sure that everything was good to go before he left the plant. When he arrived at the job site, the contractor was ready to start the pour. Fresh concrete was made right there and then. Sean was able to back up the truck to the footings and poured the concrete straight out of the truck. He successfully delivered 1 yard of 4500 PSI concrete. At the end of the pour, the contractor was able to remit payment directly to the driver. The job was completed in a timely manner and the contractor was very pleased with the service provided by the staff at Quality Concrete. Making A Small Concrete Delivery To Pour Footings In Woodbridge, NJ. A contractor in Woodbridge, NJ was looking for a small concrete delivery to pour a few footings. He was looking for about a yard of concrete, and wanted a local company to make the delivery. He saw a Quality Concrete truck in his neighborhood, wrote down the phone number on the truck, and contacted their office to get pricing and information. When he called their office, the concrete coordinator provided him with all the information he needed, and help got him on the calendar. Sean, the Field Supervisor, was out to make the delivery. Before he left the plant, he called the contractor to introduce himself and let him know that he was on his way to the job site. When Sean arrived, the area was all set up so he could start pouring. He backed the truck up as close as possible to the footings, and he began to mix fresh concrete for the contractor right at the job site. The mobile mixer trucks used by Quality Concrete carry all the ingredients needed to make fresh concrete on site, so contractors and homeowners get the freshest concrete available. The concrete was poured straight out of the truck and into the footings in a timely manner. At the end of the delivery, the contractor was able to pay for the delivery right there and then using his credit card. The job was successfully completed and the contractor was extremely pleased with the service provided by the staff at Quality Concrete. Saturday Delivery In South Amboy, NJ. A contractor in South Amboy, NJ was looking for a Saturday delivery to pour a section around the pool for one of their customers. The contractor needed about 20 yards of concrete and was looking for a local company to do the pour. He contacted a few companies and found Quality Concrete. He liked their customer service, price, and booked a delivery. Jay, the Concrete Specialist was assigned the duty to make the delivery. That day, Jay checked then loaded his truck to make sure that everything was good to go for the delivery. When he arrived at the job site, the crew was ready to start the pour. The driveway was not wide enough for the truck to back up as close as possible to the back of the house, so wheel barrows were used to get the concrete out of the truck. The first truck was delivered in a timely manner. The contractor needed some time to finish the concrete, so Jay was able to drive back to the plant, reload his truck, and bring the second delivery to the contractor. Jay successfully delivered 20 yards of 4000 PSI. The contractor was able to pay the driver using his credit card, and was given a receipt for his purchase. The job was completed in a timely manner, and the contractor was very satisfied with the service provided by the Quality Concrete Team. A contractor in Sayreville, NJ was interested in a concrete delivery to pour a sidewalk. The contractor has used Quality Concrete for a different job and was very pleased with the professional service, the quality of the concrete provided, so he contacted their office to place the order. When he called their office, the concrete coordinator easily accessed his file and placed the order for him. He ordered 7 yards of 4500 PSI. Ken, the Concrete Specialist, was out to make the delivery. Before Ken left the concrete plant, he made sure that his truck was loaded with the right amount of material. Then, he called the contractor to introduce himself and let him know that he was on his way to the job site. When he arrived, the sidewalk was nicely framed, and formed out. He was able to park right in front of the property, and began to make fresh concrete for the contractor right there and then. The concrete was poured straight out of the truck in a timely manner. After the delivery was completed, the contractor only used 5 yards of the 7 that he ordered, but since the metered trucks mix all the ingredients at the job site, only 5 yards of concrete were made. No concrete was wasted and the contractor only paid for the amount of concrete that he used. The job was successfully completed, and the contractor was once again highly satisfied with the professional service provided by the Quality Concrete team. Quality Concrete has been working together with the City Of Perth Amboy for many years. The Buildings and Grounds Department was working on setting up benches for one of their parks, and needed a few yards of concrete. The Property Manager in charge of the project contacted Quality Concrete to place the order. The Concrete Coordinator collected all the information needed for the order and scheduled the time for delivery that worked best for the property manager. Sean, the Field Supervisor, was in charge of the delivery. He loaded his truck and made sure that everything was good to go for the pour. Before he left the concrete plant, he contacted the Property Manager to introduce himself, and inform him that he was on his way to the job site. When Sean arrived, the crew working there was ready to start the pour. They were pouring concrete pads to set up the benches at the park. Fresh Concrete was mixed right on site. Wheel barrows were used to transport concrete from the truck to the areas where they would be poured. Sean successfully delivered 2 yards of 3500 PSI. The benches were beautifully installed through the park. The job was completed and the City of Perth Amboy was extremely satisfied with the outstanding service provided by the Quality Concrete team. Quality Concrete has been working together with local contractors in Middlesex, Monmouth, Somerset, and Union County, NJ for many years. One of the them in Middlesex County was pouring a driveway for one of his customers located in Fords, NJ. He needed a few yards of concrete, so he called the Quality Concrete office to place the order. The Concrete Coordinator collected all the information needed for the delivery, and scheduled the pour. Sean, the Field Supervisor was in charge of the delivery. He loaded his truck and made sure that everything was good to go for the delivery. Sean called the contractor before he left the yard to introduce himself, and inform him that he was on his way to the job site. When he arrived, the crew was ready to start the pour. The contractor was pouring a driveway, so Sean was able to park the truck right in front of the property, and began to make fresh concrete right there and then. The area was nicely formed and framed out, so the concrete was poured right into the driveway. No wheel barrows were need. Sean successfully delivered 8 yards of 4500 PSI concrete. The contractor was able to remit payment directly to the driver, and got a receipt for his purchase. The job was completed in a timely manner, and the contractor was very pleased with the quality of the concrete and the service provided by the staff at Quality Concrete. A Sayreville, NJ contractor was pouring a driveway and needed concrete delivered. He had used Quality Concrete before and was very pleased with their service. The contractor decided to call their office and place the order. When he called, the Concrete Coordinator easily located his file and scheduled the delivery for him. The delivery was made by Jay, the Concrete Specialist. Before Jay left the concrete plant to make the delivery, he checked and loaded his truck to make sure that everything was good to go. He also contacted the contractor to introduce himself, and inform him that he was on his way to the job site. When Jay arrived, the area was already framed out, and the crew at the job site was ready to start the pour. Fresh concrete was made for the contractor right there and then. Quality Concrete trucks carry all the ingredients needed to make concrete, and mixing them on site offers more flexibility and better quality. Since the contractor was pouring a driveway, Jay was able to park the truck right in front of it, place the chute over the area, and pour straight out of the truck. The concrete was delivered in a timely manner and no wheel barrows were needed. At the end of the delivery, the contractor was able to to remit payment directly to the driver. The job was completed on time and once again the contractor was very pleased with the service provided by the Quality Concrete team. Our Contracting Division was working on a project for a community in Metuchen, NJ. They were pouring sidewalks and needed concrete delivered to replace them. The Contracting Coordinator provided Quality Concrete with all the information for the job site, and the dispatcher made the appropriate arrangements to get a truck out to make the delivery. Contracting needed about 4 yards of 4500 PSI to replace the sidewalks. Carlos, the Concrete Specialist, in charge of the delivery loaded his truck and made sure that everything was good to go before he left the concrete plant. Carlos then proceeded to call the Contracting Foreman to inform him that he was on his way to the job site. When the Concrete Specialist arrived, the Contracting crew was ready to start the pour. Carlos placed the chute right over the sidewalk, and began to mix fresh concrete. He used the lever on the concrete truck to move the chute from side to side to make sure that the entire area was covered in cement, and the contracting crew floated and finished the concrete. At the end of the delivery, Carlos washed the chute to make sure that it was ready to be used at the next delivery. The pour was a success. The job was completed in a timely manner, and the people at the Metuchen, NJ community were very pleased with their brand new sidewalks. A Middlesex County contractor was working on a driveway for one of his customers. He needed about 10 yards of 4500 PSI to be delivered to Piscataway, NJ. The contractor had used Quality Concrete before for other jobs, so he decided to contact them to schedule the pour. When he called their office, the Concrete Coordinator collected all the information needed for the pour, and scheduled the delivery. Jay, the Concrete Specialist, was in charge of the delivery. He made sure that his truck was fully loaded and ready to go for the next morning. The day of the delivery, Jay contacted the contractor to introduce himself and inform him that he was on his way tot he job site. When he arrived at the location, the contractor and his crew were ready to start the pour. Fresh concrete was mixed right there and then. The concrete truck was parked right in front of the driveway, and the concrete was poured straight into the driveway area. The contractor and his crew floated the concrete as Jay moved the chute along the driveway. Once the pour was done, the chute was washed out to ensure quality at the next delivery. Jay successful delivered the 10 yards in a timely manner. The job was completed, and the contractor was very pleased with the outstanding service provided by the Quality Concrete Team. A contractor in South River, NJ was pouring a patio and needed concrete delivered. He needed about 4 yards of concrete and was looking for a local contractor to make the pour. He was searching the web and came across the Quality Concrete website. The contractor got their number and called their office to get a price and schedule the pour. Ken, the Concrete Specialist, was out to make the delivery. When Ken arrived at the job site, he realized that the driveway was not wide enough to back the truck up as close as possible to the patio area, so he had to park at the front of the property. He started mixing fresh concrete right there and then. Wheel barrows were used to transport the concrete from the truck to the patio section. The contractor had 4 wheel barrows, so getting the concrete out of the truck was done in a timely manner. Once all the concrete was poured, Jay washed the concrete chute to ensure quality at the next job site. At the of the delivery, the contractor was able to make a payment directly to the driver using his credit card. The job was successfully completed and the contractor was very satisfied with the excellent service provided by the Quality Concrete team. A Contractor in South Plainfield, NJ was pouring a concrete slab for a shed and needed a few yards of concrete to do the job. He was looking for a local company to make the delivery at an affordable price. He searched the web for companies in his area, and came across Quality Concrete. He read a little about their company, saw that they were the local concrete supplier for South Plainfield, NJ, and decided to give them a call to place the order. The Concrete coordinator collected all the information needed to get the truck out to the job site, and scheduled the delivery. Ken, the Concrete Specialist, was out to make the delivery. He prepped his truck and made sure that it was good to go for the pour. The day of the delivery, he contacted the contractor to introduce himself, and inform him that he was on his way to the property. Ken arrived to the job site, parked the truck in front of the property, and began to make fresh concrete. The concrete slab was in the back of the property, so wheel barrows were used to transport the concrete from the truck to the area that needed to be poured. Once all the concrete was taken out of the truck, the chute was washed out to make sure it was ready to be used at the next delivery. The contractor had order 4 yards of 4000 PSI, but only used 3. Quality Concrete has meter trucks that mix the concrete on site so only 3 yards of concrete were made. No concrete was wasted and the contractor only had to pay for the amount of concrete that he used. The job was completed in a timely manner and the contractor was extremely pleased with the service provided by the Quality Concrete team. A Contractor in Woodbridge, NJ was looking for a small concrete delivery. He was replacing a slab and needed about a yard of concrete to be delivered. He had used Quality Concrete before for a previous job, so he called them to find out if they would be able to deliver 1 yard. When he got on the phone with the Concrete Coordinator, she informed him that making the delivery was not a problem, and scheduled the pour. Sean, the Field Supervisor, was out to make the delivery. When he arrived at the job site, the area was ready for him to pour. It was a nice and quick pour. He mixed the concrete right on site and poured it directly into the slab area. once the concrete was out, Sean washed the chute to ensure quality at his next delivery. The contractor was able to remit payment directly tot he driver with a check. Quality Concrete drivers take cash, credit, and check payments, making it easy for contractors and homeowner to pay for their deliveries. The job was competed in a timely manner, and the contractor was very please with the service provided by the Quality Concrete team. Quality Concrete was started in 2004 to supply concrete for our Contracting Division. Since then, Quality Concrete has delivered for every contractinf job. Contracting was working on a project in Middlesex County and needed concrete in Perth Amboy, NJ. The Contracting manager contacted the Concrete Coordinator and schedule the delivery. Jay, Senior Concrete Specialist, was out to make the delivery. He brought 4 yard of 4500 PSI to pour a sidewalk. He parked right in front of the sidewalk, placed the chute over it, and began to make fresh concrete. Making the concrete at the job site offers more flexibility and better quality. The concrete was poured straight into the sidewalk area, eliminating the use of wheel barrows. As Jay poured the concrete, the Contracting Crew floated, finished, and edged the sidewalks. Once all the concrete was taken out of the truck, Jay washed the chute to ensure quality at the next delivery. The job was completed in a timely manner, and the pour was a success. A Contractor In North Brunswick, NJ was pouring a big driveway for one of his customers, and needed about 30 yards of concrete to be delivered in one day. He had used Quality Concrete before, and knew that scheduling the delivery would not be a problem. He contacted the Concrete Coordinator and gave her all the information needed to make the delivery. Sean, the Field Supervisor, and Jay, Senior Concrete Specialist, were in charge of making the delivery. Jay was out to deliver the first truck. When he arrived at the job site, he began to mix fresh concrete right there and then. The concrete was poured into wheel barrows so the crew could bring it to the back end of the driveway. Once the concrete was poured, the crew at the site began to spread the concrete out. About an hour later, the first truck was done, and Sean arrived with the second one. The concrete from the second truck was efficiently poured directly into the driveway area. While Sean was pouring, Jay went back to the yard to reload, and bring the third truck. A total of 30 yards were successfully delivered. At the end of the delivery, the contractor was able to pay for the concrete with his credit card and got a receipt for the purchase. The contractor was able to finish the job in one day, and was again greatly satisfied with the service provided by the Quality Concrete team. A Contractor in Middlesex County was looking to pour a section of a driveway and needed concrete delivered. He was looking for about 4 yards of 4000 PSI. Searching the web, he came across the Quality Concrete Website and contacted them to get information about their services. When he spoke to the Concrete Coordinator, he was informed that the concrete for the job would be mixed right on site and he was very excited. The delivery was scheduled for first thing int he morning. Jay, Senior Concrete Specialist, was in charge of making the delivery. The night before, Jay loaded his truck with the right amount of material, and made sure the truck was good to go for the next morning. The morning of the delivery, Jay contacted the contractor to introduce himself and inform him that he was on his way to the job site. When he arrived, the area was nicely framed out and the crew was ready to start the pour. The truck was parked right at the front of the house, and the chute was extended out to the the driveway area to pour the concrete. Fresh concrete was made right there and then offering more flexibility and better quality. As the concrete was poured, the crew at the job site floated and finished the concrete. At the end of the delivery, the contractor was able to pay with his credit card. The job was completed in a timely manner, and the job was a success. A Contractor in Middlesex County was pouring a section of a driveway, and a handy cap ramp. He measured the areas and calculated that he would need about 5 yards of concrete to do the job. Searching the we he came across the Quality Concrete page and contacted them to schedule a delivery. The Concrete Coordinator collected all the information needed for the pour, and put it on the calendar. Carlos, the Concrete Specialist, was out to make the delivery. The morning of the delivery, Carlos contacted the contractor before he left the concrete plant to inform him that he was on his way to the job site. Once Carlos arrived, he parked the truck right in front of the property, and got out to introduce himself. The contractor showed him the area that they were pouring, and Carlos moved the truck to be as close as possible to the framed out area. He extended the chute, and placed it right above the driveway so the concrete would be poured directly into it. Fresh concrete was mixed right there and then offering more flexibility, and better quality. After the driveway was poured, they moved on to the ramp. At the end of the delivery, the contractor only used 4 yards of the 5 that he ordered. Only 4 yards of concrete were made at the job site, so the contractor paid only for the amount that he used. The job was completed in a timely manner, and the contractor was very satisfied with the service provided by the Quality concrete team. A contractor in Middlesex County was pouring a loading ramp at a warehouse in Edison, NJ and needed about a yard of concrete delivered. He had used Quality Concrete before, so he contacted their Concrete Coordinator to schedule the delivery. When the contractor called, the Coordinator collected all the information needed for the delivery, and placed it on the calendar. Sean, the Field Supervisor, was out to make the delivery. When he got to the job site, he was able to back up all the way to the loading ramp. Once he parked, he got out of the truck to introduce himself. The contractor and his crew were ready to start the pour, so Sean began ti mix fresh concrete right there and then. As the concrete was poured, the crew floated and finished the concrete. After all the concrete was taken out of the truck, Sean washed the chute to make sure it was ready to be used at the next job site. At the end of the delivery, the contractor was able to pay the driver directly using his credit card. The job was successfully completed, and the contractor was once again very pleased with the service provided by the staff at Quality Concrete. A contractor in Middlesex County was pouring footings in New Brunswick, NJ and needed a few yards of concrete to be delivered. The township inspector referred him to Quality Concrete, so he could order the concrete he needed. When the contractor contacted their office, the Coordinator collected all the information needed for the pour, gave him all the pricing information, and scheduled the delivery for him. Sean, the Field Supervisor, was in charge of making the delivery. He loaded his truck the night before, and made sure everything was set for the next morning. The day of the delivery, Sean contacted the contractor to inform him that he was on his way to the job site. When Sean arrived, he backed the truck up as close as possible to the footings. He got out of the truck and began to mix fresh concrete right there and then. The concrete was poured directly into majority of the footings, and for the rest, wheel barrows were used to transport the concrete. Once all the concrete was taken out of the truck. Sean washed the concrete chute to ensure quality at the next delivery. At the end of the delivery, the contractor was able to remit payment directly to the driver. The job was completed in a timely manner, and the contractor was very please with the service provided by the Quality Concrete team. A Contractor in Minddlesex County was pouring a sidewalk and needed concrete delivered to Highland Park, NJ. He had used Quality Concrete before, so he contacted them to schedule the pour. When he called their office, the concrete Coordinator collected all the information needed for the delivery, and scheduled the pour. Sean, the Field Supervisor, was in charge of making the delivery. The contractor needed 4 yards of 3500 PSI concrete, so Sean made sure to load the truck with enough material for the pour. When he arrived at the job site, he parked the truck right in front of the framed out sidewalk. He then proceeded to get out of the truck to start the pour. Fresh concrete was made right there and then. Sean used the levers to move the chute along the sidewalk to make sure the entire areas was covered with concrete. As the concrete was poured, the crew at the job site floated and finished the concrete. Once all the concrete was taken out, Sean washed the chute to ensure quality at his next job. At the end of the delivery, the contractor was able to remit payment directly to the driver. The job was completed in a timely manner, and was very pleased with the service provided by Quality Concrete. Our Contracting Division was working on a concrete replacement project at a community in Monroe Township, NJ and needed a few concrete deliveries. They were replacing sidewalks and walkways, and would need over 50 yards of concrete over a week period of time. All the deliveries were scheduled, and both divisions worked together to make sure everything went well that week. Jay, Senior Concrete Specialist, was in charge of making the deliveries. Every morning Jay made sure to fully load his truck, and contact the foreman at the job site to inform him that he was on his way there. Once Jay arrived at the site, the areas that needed to be poured were nicely framed out, and the crew was ready to go. Fresh concrete was mixed at the job site every time. Some days multiple deliveries were needed in one day. In that case, Jay would deliver the first 10 yards, then drive back to the office to reload his truck, and bring the additional 10 yards they needed. All the concrete that was needed was delivered in a timely manner, and all the sidewalks and always were nicely replaced. At the end of the project the customer were very happy with their brand new concrete. A contractor in Middlesex County was pouring a walkway in Fords, NJ and needed concrete delivered. He contacted a few companies to make the delivery, and came across Quality concrete. He contacted their office to get a quote and get some information. The Concrete Coordinator gave him the pricing he needed, and helped him calculate the amount of yards he needed. The contractor was very please with the customer service and decided to book the pour. Jay, the Concrete Specialist, was in charge of making the delivery. He loaded his truck the day before, and made sure that everything was set for the next day. The morning of the delivery, Jay contacted the contractor to introduce himself, and inform him that he was on his way to the job site. When Jay arrived, he parked the truck right in front of the house, and got out of the truck to start the pour. The crew was ready, and the walkway was nicely framed out. The driveway was not wide enough for the truck to back up closer to the walkway area, so wheel barrows were used to transport the concrete. Since the concrete was mixed right at the job site, the contractor had more time to work on the concrete. Once the poured was completed, Jay washed the chute to make sure that it was ready to be used at his next delivery. At the end of the delivery, the contractor was able to pay the driver directly with a check. Quality Concrete drivers take cash, credit card, and check payments. The job was completed in a timely manner, and the contractor was very pleased with the service provided by the Quality Concrete team. A contractor in South Plainfield, NJ was pouring a small sidewalk and needed just about a yard of concrete to do the job. He contacted a few companies, but they didn't make small deliveries. He went online searching for a company that would, and he came across the Quality Concrete website. When he contacted their office, the concrete Coordinator informed him that making the delivery for that amount was not a problem. She collected all the information needed for the delivery and scheduled the pour. Sean, the Field Supervisor, was in charge of making the delivery. The day of the delivery, he made sure to contact the contractor to inform him that he was on his way to the job site. When he arrived, he parked right in front of the framed out sidewalk, and proceed to get out of the truck to introduce himself. The crew was ready to go, so Sean began to make fresh concrete. He placed the concrete chute right over the sidewalk, and poured directly into it. As the concrete was being poured, the crew floated and finished the concrete. Once the concrete was taken out of the truck, the chute was washed out to ensure quality at the next job. At the end of the delivery, the contractor was able to remit payment directly to the driver. The job was successfully completed, and the contractor was very pleased with the service provided by the staff at Quality Concrete. A contractor in Middlesex County needed a few yards of concrete to pour a trench in Woodbridge, NJ. He had used Quality Concrete before, so he contacted them to schedule the delivery. When he called their office, the concrete Coordinator collected all the information needed for the delivery, and got him on the calendar. Sean, the Concrete Specialist, was in charge of making the delivery. He checked and loaded his truck the day before to make to make sure everything was set for the next day. The day of the delivery, Sean contacted the contractor when he was on his way to the job site, and introduced himself. Once at the job site, Sean was able to back up as close as possible to the trench. He extended the chute all the way out, placed it right over the trench, and began to mix fresh concrete right there and then. The concrete was poured directly into the trench. No finishing was needed, so as soon as the concrete was out, Sean washed the concrete chute to ensure quality at his next delivery. 4 yards of 3500 PSI were successfully delivered. The job was completed in a timely manner, and the contractor was very pleased with the outstanding service provided by Quality Concrete. A contractor in South River, NJ was looking for a delivery to pour a basement floor. He took measurements and determined that he would need about 10 yards of concrete. He called a few companies and came across Quality Concrete. He went on their website, read about their services and coverage area, and decided to call them to schedule the delivery. When he contacted them, the Concrete Coordinator provided him with all the pricing information and scheduled the pour. Sean, the Field Supervisor, was assigned to make the delivery. He checked his truck and loaded it with enough material to make 10 yards of concrete. The day of the delivery, he made sure to contact the contractor to introduce himself, and inform him that he was on his way to the job site. Once Sean arrived, he was able to to back buck into the driveway to get closer to the basement. He parked right in front of a window where the extension chute would be placed to get the concrete inside the basement. Fresh concrete was mixed right at the job site and poured into the extension chute. Inside the basement, the crew used wheel barrows to transport the concrete to the back end of the basement floor. Once all the concrete was taken out of the truck, both chutes were washed out to ensure quality at the next delivery. At the end of the pour, the contractor was able to remit payment directly to the driver. The job was successfully completed, and the contractor was very pleased with the outstanding service provided by Quality Concrete. A contractor in Middlesex County was replacing a few sidewalks in New Brunswick, NJ. He was looking for a local contractor to make the delivery an an affordable price. He went online to search for companies, and he came across the Quality Concrete Website. He read about their services and coverage area, so he decided to give them a call. The Concrete Coordinator collected all the information needed for the pour and scheduled the delivery. Carlos, Senior Concrete Specialist, was in charge of making the delivery. He checked and loaded his truck to make sure that everything was set for the delivery. He also contacted the contractor to inform him that he was on his way to the job site. When Carlos arrived, the sidewalks were nicely framed out, and the crew was ready to start the pour. Carlos parked right in front of the sidewalks and placed the chute right over them so the concrete could be poured directly into them. The lever on the truck were used to move the chute along the sidewalk to make sure the entire area was covered in concrete. As the concrete was poured, the crew floated and finished the concrete. Once all the concrete was taken out of the truck, Carlos washed the chute. At the end of the delivery, the contractor was able to make a payment directly to the driver using his credit card. The delivery was made in a timely manner and the job was successfully completed. A Contractor in Middlesex County was pouring a walkway in Perth Amboy, NJ and needed concrete delivered. He had seen a Quality Concrete truck on the road and, wrote down their number, and decided to give them a call. When he contacted their office, the concrete coordinator helped him calculate hoe munch concrete he would need, gave him a price over the phone, and scheduled the delivery. Sean, the Field Supervisor, was assigned to make the delivery. The contractor needed about 2 yards of concrete. He checked his truck and ,and made sure that he had enough material to make the delivery. He gave the contractor a call to inform him that he was on his way to the job site. When Sean arrived, the contractor showed him the area that they were working. The walkway was behind the house, so the truck was backed up into the driveway to get closer to the back of the house. Fresh concrete was made for the contractor and poured into wheel barrows. Using the wheelbarrows, the concrete was transported to the walkway area. Two crew members brought the concrete over to the framed out walkway, and another 2 floated and finished the concrete. Once all the concrete was out of the truck, Sean washed the chute to ensure quality at his next delivery. At the end of the delivery the contractor was able to make a payment directly to the driver with a check. The job was completed in a timely manner, and the contractor was very pleased with the service provided by Quality Concrete. A contractor in Edison, NJ was pouring a sidewalk and a driveway for one of his customers, and needed a few yards of concrete delivered. He was looking for a local company to make the delivery on a Saturday at an affordable price. Searching the web, he came across the Quality Concrete website, and gave their office a call to get pricing. When he called, the Concrete Coordinator gave him a quote over the phone, and scheduled the delivery for him. Jay, Senior Concrete Specialist, was in charge of making the delivery. The morning of the delivery, he loaded his truck and made sure that everything was set for the pour. He also contacted the contractor to inform him that he was on his way to the job site. When Jay arrived, the area that they were working on was nicely framed out, and the crew was ready to start the pour. Fresh concrete was mixed right at the job site. Mixing the concrete on site offers more flexibility to work the concrete, and it is cost effective. Wheel barrows were used to transport the concrete to the walkway area. For the sidewalk, Jay was able to place the chute right above it, and poured directly into the framed out area. As he was pouring, the crew floated and finished the concrete. Once all the concrete was taken out of the truck, the chute was washed out to ensure quality at the next delivery. At the end of the delivery, the contractor was able to pay the driver directly with a check. The job was successfully completed, and the contractor was very pleased with the service. A contractor in Middlesex County was looking for 10 yards of concrete to be delivered to North Brunswick, NJ to pour a driveway. The contractor had been using Quality Concrete for a few years now, so he knew that getting the delivery would not be a problem. He contacted their office and provided the Concrete Coordinator with all the information needed for the delivery so it could be scheduled. Ken, the Concrete Specialist, was out to make the delivery. Ken checked and loaded his truck with enough material to deliver the 10 yards the contractor ordered. When Ken arrived at the job site, he was able to back the truck up as close as possible to the framed out driveway. He began to mix fresh concrete right there and then. The concrete was poured into wheel barrows so it could be transported to the back end of the driveway. As the crew got closer to the front section of the driveway, the concrete was poured directly into the area without having to use any wheel barrows. As the concrete was poured, the crew floated and finished the concrete. At the end of the delivery the chute was washed out to ensure quality at the next delivery. At that point the contractor was able to pay the driver directly with a check. The driveway was successfully poured, and once again the contractor was extremely pleased with the service provided by the staff at Quality Concrete. An electrician in Middlesex County was setting up light poles in Metuchen, NJ and needed concrete delivered to pour the light pole bases . He had used Quality Concrete before so he contacted them to schedule the delivery. When he called their office, the Concrete Coordinator collected all the information needed to make the delivery, and scheduled the pour. Jay, Senior Concrete Specialist, was out to make the delivery. He loaded his truck and made sure that everything was set for the pour. When he was on his way to the job site, Jay contacted the contractor to give him an estimated time of arrival. Once at the site, Jay parked the truck in front of the first light pole base, and got out of the truck to introduce himself. The contractor showed the Concrete Specialist all the bases that needed to filled with concrete and they started the pour. The chute was placed right above each base, and the concrete was poured directly into each one of them. There were a few bases that were not accessible by the chute, so wheel barrows were used to transport the concrete from the truck over to them. After all the concrete was taken out of the truck, the chute was washed out to make sure that it was ready to be used at the next delivery. When the delivery was completed, the contractor was able to make a payment directly to the driver using his credit card. The job was completed in a timely manner and once again the contractor was very pleased with the staff at Quality Concrete. A contractor in Sayreville, NJ was pouring an apron and a sidewalk for one of his customers and needed concrete to be delivered. He had used Quality Concrete before so he contacted them to schedule the delivery. When he called their office, the Concrete Coordinator collected all the information needed for the delivery and got him on the calendar. Carlos, Senior Concrete Specialist, was in charge of making the delivery. He prepped his truck and made sure that everything was set for the pour. When he was on his way to the job site, Carlos contacted the contractor to give him an estimated time of arrival. When he got to the job site, the sidewalk and the apron were nicely framed out. Carlos placed the chute right above the sidewalk and began to mix fresh concrete right there and then. The concrete was poured right into the sidewalk, and as it was poured the crew at the site floated, finished, and edged the concrete. When all the concrete was taken out of the truck, Carlos washed the chute to make sure that it was ready to be used at his next delivery. At the end of the pour, the contractor was able to remit payment directly to the driver using his credit card. The job was successfully completed, and the contractor was very pleased with the service provided by the Quality Concrete staff. A contractor in Middlesex County was pouring a driveway and needed about 20 yards of concrete to be delivered to South Amboy, NJ. The contractor had used Quality Concrete before so he contacted them to schedule the pour. When he called their office, the Concrete Coordinator collected all the information needed for the delivery and got him on the calendar. Sean, The Field Supervisor, was in charge of making the delivery. He prepped his truck and made sure that everything was set for the por. Sean contacted the contractor before he left the concrete plant to introduce himself and inform him that he was on his way to the job site. Once at the site, Sean parked the truck as close as possible to the driveway area. He began to mix fresh concrete right there and then and poured it into wheel barrows so it could be transported to the back end of the driveway. As the crew got closer to the front of the driveway, Sean was able to pour directly into the framed out driveway. When all the concrete was out of the truck the chute was washed out to ensure quality. The first 10 yards were successfully delivered. Sean drove back tot he concrete plant, reloaded his truck, and brought the contractor the additional 10 yards that he needed. When the pour was completed the contractor was able to remit payment directly to the driver using a check. 20 yards of 4000 PSI were delivered in a timely manner, and the contractor was once again very pleased with service provided by Quality Concrete. A Contractor in Dayton, NJ was looking for a concrete delivery to pour a few sets of stairs at a community in Middlesex County. He had used Quality Concrete before, so he contacted them to schedule the delivery. When the contractor called, the Concrete Coordinator provided him with a price over the phone, collected all the information needed for the pour, and got him on the calendar. Carlos, Senior Concrete Specialist, was in charge of making the delivery. He prepped, loaded his truck, and made sure everything was set for the next day. Before Carlos left the concrete plant, he contacted the contractor to introduce himself and inform him that he was on his way to the property. Once at the job site, the truck was backed up as close as possible to the stairs. Fresh concrete was mixed right at the site and poured directly into the framed out stairs. When all the concrete was taken out of the truck, Carlos washed the chute to ensure quality at his next delivery. At the end of the pour, the contractor was able to remit payment directly to the driver using his credit card. The job was successfully completed and the contractor was very pleased with the service provided by Quality Concrete. A contractor in Cranbury, NJ was pouring a few light pole bases and needed concrete to be delivered. He had used Quality Concrete before so he contacted them to schedule the pour. When he contacted their office, the Concrete Coordinator assisted him in calculating how many yards he would need for the pour, and scheduled the delivery for him. Jay, Senior Concrete Specialist, was in charge of making the delivery. Jay loaded his truck and drove over to the job site. When he was on his way, Jay contacted the contractor to give him an estimated time of arrival. When he arrived, he parked the truck and began to mix fresh concrete right at the site. Using the levers on the truck, Jay moved the chute from one pole base to the other and poured the concrete directly into them. Once all the concrete was out of the truck, the chute was washed out to ensure quality at his next delivery. 4 yards of 4500 PSI were successfully delivered. At the end of the pour, the contractor was able to remit payment directly to the driver using a check. The job was completed in a timely manner and the contractor was once again very pleased with the service provided by Quality Concrete. A contractor in Old Bridge, NJ was pouring a small walkway for one of his customers and needed about 3 1/2 yards of concrete to be delivered. He had used Quality Concrete before for another pour, so he decided to call them to schedule the delivery. When he contacted their office, the Concrete Coordinator easily located his information. She also assisted him in calculating how much concrete was needed for the pour and got him in the calendar. Jay, Senior Concrete Specialist, was out to make the delivery. He loaded his truck the night before and made sure that everything was set for the next morning. When Jay was on his way to the property, he contacted the contractor to provide him with an estimated time of arrival. When Jay got to the job site, the area was nicely framed out and the crew was ready to pour. The concrete was mixed right on site and poured into wheel barrows to be transported to the walkway area. Twos crew members brought the concrete over, and the other two took care of floating and finishing the concrete. When all the concrete was taken out of the truck the chute was rinsed out to ensure quality at the next delivery. The pour was a success. The concrete was taken out in a timely manner and the walkway was nicely finished. A contractor in Middlesex County was pouring a small sidewalk and needed about a yard of concrete to be delivered. He was having a hard time finding a company to make a small delivery, so he went online looking for a company that would. He was searching for a local provider to make the delivery at an affordable price. He came across the Quality Concrete website, read about their service and decided to give them a call. When he contacted their office, the Concrete Coordinator informed him that delivering a yard of concrete would not be a problem. She also collected all the information needed for the pour and got him on the calendar. Sean, the Field Supervisor, was out to make the delivery. When he was on his way to the job site, Sean contacted the contractor to introduce himself and provide him with an estimated time of arrival. When Sean arrived, he parked the truck right in front of the framed out sidewalk and got out of the truck. The chute was extended out and placed right above the sidewalk area. Fresh concrete was mixed for the contractor right there and then and poured directly into the sidewalk. Mixing the concrete on site offers more flexibility and better quality. The concrete was taken out of the truck in a timely manner. At the end of the delivery the chute was washed out to ensure quality at the next delivery. The contractor was able to remit payment directly to the driver using his credit card. The job was successfully completed, and the contractor was very pleased with the service provided by the staff at Quality Concrete. A contractor in Middlesex County was pouring a driveway for one of his customers and needed concrete to be delivered to Sayreville, NJ. He was looking for a local contractor to make the delivery at an affordable price. He went on the web searching for a company, and he found Quality Concrete. He read about their services and saw that they were located in the next town over, so he decided to give them a call. When he called their office, the concrete coordinator assisted him in calculating how much concrete he would need, provided a price over the phone and collected all the information needed to schedule the delivery. Carlos, Senior Concrete Specialist, was assigned to make the delivery. He prepped his truck and made sure that everything was set for the delivery the next morning. The day of the delivery, he contacted the contractor to introduce himself and inform him that he was on his way to the property. When Carlos arrived, the driveway area was ready and nicely framed out. The truck was parked right in front of the driveway, and the chute was extended out to start the pour. Fresh concrete was mixed right at the site, and poured directly into the framed out driveway. As the concrete was being poured, the crew floated and finished the concrete. Once all the concrete was out of the truck, the chute was washed out to ensure quality at the next delivery. At the end of the pour, the contractor was able to remit payment directly to the Concrete Specialist. The delivery was a success, and the contractor was very pleased with the service provided by the staff at Quality Concrete. A contractor in Middlesex County was pouring a small sidewalk and needed concrete to be delivered. He went online looking for a concrete supplier and came across the Quality Concrete website. He read about their service and decided to call them to get more information. When he called their office, the Concrete Coordinator provided him with a price over the phone. She also collected all the information needed for the delivery and scheduled the pour for the contractor. Jay, Senior Concrete specialist, was out to make the delivery. He loaded his truck and made sure that everything was set for the pour. When Jay was on his way to the property, he contacted the contractor to introduce himself and provide him with an estimated time of arrival. Once at the property, Jay parked the truck right in front of the framed out sidewalk. The crew at the site was ready to start the pour, so fresh concrete was mixed for them right there and then. The chute was extended out and the concrete was poured directly into the sidewalk area. As the concrete was being poured, the crew floated and finished the concrete. When all the concrete was taken out of the truck, the chute was washed out to ensure quality at the next delivery. At the end of the pour, the contractor was able to remit payment directly to the driver. The job was successfully completed, and the contractor was very pleased with the service provided by the staff from Quality Concrete. A contractor in Middlesex County was pouring a few walkways in Edison, NJ and needed concrete to be delivered. He had used Quality Concrete before at another job site, so he decided to give them a call. When he contacted their office, the Concrete Coordinator easily located his file, and collected all the information needed for the delivery. Sean, the Field supervisor, was in charge of making the delivery. The contractor ordered 10 yards of 4500 PSI, so Sean made sure to fully load his truck. When Sean was on his way to the job site, he contacted the contractor to provide him with an estimated time of arrival. When Sean arrived, the crew at the site was ready to start the pour. The walkways were all framed out so fresh concrete was mixed for them right there and then. Wheel barrows were used to transport the concrete from the truck to the walkway areas. Two crew members transported the concrete and the other two floated and finished it. Once all the concrete was taken out of the truck and the pour was completed, the contractor was able to remit payment directly to the driver. The job was a success and the contractor was very pleased with the service provided by Quality Concrete. Our Contracting Division was replacing a few concrete slabs at a community in Edison, NJ and needed concrete to be delivered. They needed a small amount of concrete, but that was not a problem for Quality Concrete because they have metered trucks that mix the concrete on site. The Contracting Coordinator placed the order and made the proper arrangements to make sure the truck arrived at the job site first thing in the morning. Carlos, the Senior Concrete specialist, was in charge of making the delivery. He loaded his truck and headed over to the job site. When he was on his way, Carlos made sure to call the Contracting Foreman to provide him with an estimated time of arrival. Once at the site, the truck was parked right in front of the property. The crew was ready to start pouring, so Carlos Mixed fresh concrete for them right there and then. The concrete was poured into wheelbarrows so it could be transported to the areas that needed to be replaced. Two crew members transported the concrete, and the other two floated and finished the concrete. 4 yards of 4500 PSI were successfully completed. At the end of the delivery, the chute was washed out to ensure quality at the next delivery. The job was completed and all the slabs that needed to be replaced were nicely finished. A contractor in Middlesex County was pouring a new driveway and needed concrete to be delivered. He had use Quality 1st Concrete before, was very pleased with their service, so he decided to give them a call. When he contacted their office, the Concrete Coordinator assisted him in calculating how much concrete he would need for the pour, gave him a price over the phone, and scheduled the delivery. Ken, the Concrete Specialist, was in charge of making the delivery. He prepped and checked his truck to make sue that everything was set to go. When he was on his way to the property, he contacted the contractor to provide him with an estimated time of arrival. Once at the job site, Ken parked right in front of the driveway. He go out of the truck to introduce himself, and to start the pour. Fresh concrete was mixed right there and then and poured into the driveway. For the areas all the way in the back, wheel barrows were used to transport the concrete. For the rest, the chute was placed in the middle section of the driveway to pour the concrete and the crew at the site floated and finished the concrete. At the end of the delivery, the chute was washed out to ensure quality at the next job site. The contractor was able to remit payment directly to the driver, and got a receipt for his purchase. The concrete was successfully completed, and the contractor was very pleased with the service provided by the staff at Quality 1st Concrete. A Contractor in Middlesex County was in need of a concrete delivery to go to Edison, NJ. He was pouring a few concrete slabs and calculated that he would need about 2 yards of concrete to finish the job. He was looking for a local contractor to make the delivery at an affordable price. He went on the web looking for a concrete supplier and came across the Quality 1st Concrete website. He contacted them to get some information and a quote. when he called their office, the Concrete Coordinator gave him a price over the phone and got him on the calendar. Carlos, the Senior Concrete Specialist, was out to make the delivery. Carlos contacted the contractor before he left the concrete plant to inform him that he was on his way to the property. When Carlos arrived, he parked the truck and got out to introduce himself. The area that had to be poured was already formed and framed out. Fresh concrete was mixed right at the job site. The contractor was pouring a sidewalk, so the chute was placed right above the area and the concrete was poured directly into it. As the concrete was being poured, the crew at the site floated and finished the concrete. When the pour was completed, the concrete chute was rinsed out to ensure quality at the next delivery. The job was successfully completed, and the contractor was very pleased with the service provided by the staff at Quality 1st Concrete. A Contractor in Middlesex County was pouring a few walkways and needed concrete delivered to Woodbridge, NJ. He had used Quality 1st Concrete before, so he decided to give them a call to schedule the pour. When he called their office, the Concrete Coordinator easily located his file. She also collected all the information for the new pour and scheduled the delivery. Jay, the Senior Concrete Specialist, was in charge of making the delivery. The day of the pour, Jay loaded his truck and made sure that everything was set to make the delivery. Jay also contacted the contractor when he was on his way to the job site to provide him with an estimated time of arrival. Once at the job site, the truck was parked in front of the framed out walkways. The chute was extended out and placed right above the area that had to be poured. Fresh concrete was mixed right there and then, and poured directly into the walkways. As the concrete was being poured, the crew at the site floated and finished the concrete. When all the concrete was taken out of the truck, the chute was rinsed out to ensure quality at the next delivery. At the end of the delivery, the contractor was able to remit payment directly to the driver. The pour was a success and the contractor was very happy with the service provided by Quality 1st Concrete. A Contractor in Middlesex County was pouring a few footings at a property in Highland Park, NJ. He was looking for a local contractor to come out and make the delivery at an affordable price. He went online searching for a concrete supplier and he found the Quality 1st Concrete website. He read about their services and decided to contact them. When he called their office, the Concrete Coordinator provided him with a price over the phone and collected all the information needed for the pour. Ken, the Concrete Specialist, was out to make the delivery. The day before, he loaded and prepped his truck. The next morning, Ken contacted the contractor before he left the concrete plant to inform him that he was on his way to the job site. When Ken arrived at the property, he parked the truck and got out to introduce himself. He was able to back up to the footings, extended the chute, and placed it right over them. Fresh concrete was mixed right at the job site offering more flexibility and better Quality. After all the concrete was taken out of the truck, the chute was rinsed out to make sure it was ready to be used at the next pour. At the end of the delivery, the contractor only used 5 yards out of the 6 that he ordered. With the mobile mixer trucks, only five yards of concrete were made, so the contractor paid only for the amount of concrete that he used. The job was completed in a timely manner, and the contractor was very pleased with the service provided by Quality 1st Concrete. A contractor in Middlesex County was pouring a section of a sidewalk, and was in need of a small concrete delivery. He was having a hard time finding a company that would make a small delivery at an affordable price. He went online to look for a company, and he found the Quality 1st Concrete website. He decided to contact them to get some information. When he called the office, he informed the Concrete Coordinator that he only needed 2 yards of concrete. The coordinator let him know that making the delivery would not be a problem. She went ahead and collected all the information needed to make the delivery, and got him on the calendar. Sean, the Field Supervisor, was out to make the delivery. When Sean was on his way to the job site, he contacted the contractor to provide him with an estimated time of arrival. When Sean arrived to the site, he was able to park the truck right in front of the property. He extended the chute, and place it right above the framed out sidewalk. Fresh concrete was mixed at the job site and poured directly into the sidewalk. As the concrete was being poured, the crew at the site floated and finished the concrete. At the end of the delivery, the chute was washed out to ensure quality at the next pour. The contractor was able to remit payment directly to the driver, and received a receipt for his purchase. The job was successfully completed, and the contractor was very pleased with the outstanding service provided by Quality 1st Concrete. A landscaper in Monmouth, County was doing a job for one of his customers and needed about 7 yards of concrete to be delivered on a Saturday. He was looking for a local contractor to make the delivery at an affordable price, so he went online searching for concrete companies in the area. Looking through the web he came across the Quality 1st Concrete website. He saw that their plant was located right in Monmouth County, so he contacted them to get some information. When he called their office, the Concrete Coordinator provided him with a price over the phone and scheduled the delivery for him. Jay, Senior Concrete Specialist was in charge of making the delivery. Jay loaded his truck the night before and made sure that everything was set for the next day. The day of the delivery, Jay contacted the contractor to introduce himself and provide him with an estimated time of arrival. Once at the job site, Jay was able to pull up into the driveway to get closer to the area the contractor was pouring. The crew at the site was ready to start the pour, so fresh concrete was mixed for them right there and then. The concrete was poured into wheelbarrows and then brought over to the framed out walkway where the crew floated and finished it. Once all the concrete was taken out of the truck, the chute was washed out to make sure it was ready to be used at the next delivery. When the pour was finished, the contractor was able to remit payment directly to the driver using his credit card. The job was successfully completed, and the contractor was very pleased with the outstanding service provided by Quality 1st Concrete. A contractor in Middlesex County was pouring a sidewalk and needed concrete to be delivered. He was searching the web for a company that would mix the concrete at the job site, and came across the Quality 1st Concrete website. He contacted their office to get a quote and some information. He was very happy with the customer service, so he went ahead and booked the pour. Sean, Senior Concrete Specialist, was out to make the delivery. Sean contacted the contractor to introduce himslef and inform him that he was on his way to the job site. When Sean arrived at the property, the sidewalk was nicely framed out and the crew was ready to go. Sean extended the concrete chute out and placed it right above the sidewalk. Fresh concrete was mixed right there and then, and poured into the framed out area. As the concrete was being poured, the crew floated and finished the concrete. 4 yards of 3500 PSI concrete were successfully delivered. The sidewalk was nicely poured, and the contractor was very pleased with the service provided by Quality 1st Concrete. A contractor in Middlesex County was pouring a small sidewalk in Perth Amboy, NJ and needed a concrete delivery. He had used Quality 1st Concrete before, so he decided to call them to schedule the pour. When he contacted their office, the Concrete Coordinator collected all the new information needed to make the new delivery, and got him on the calendar. Jay, Senior Concrete Specialist, was out to make the delivery. The contractor ordered 2 yards of concrete so Jay made sure to load his truck with enough material to make 2 yards. When Jay was on his way to the job site, he contacted the contractor to introduce himself and provide him with an estimates time of arrival. Once at the site, the trucked was parked in front of the framed out sidewalk. The chute was extended out, and placed above the formed area. Fresh concrete was mixed right there and then and poured directly into the sidewalk. Mixing the concrete on site offers more flexibility, better quality, and waste is avoided. As the concrete was being poured, the crew at the site took care of the floating and finishing. At the end of the delivery, the contractor only used 1.5 yards out of the two that he ordered. With the mobile mixer truck only 1.5 yards were mixed, so the contractor only paid for the amount of concrete that he used. The job was successfully completed, and the contractor was very pleased with the service provided by Quality 1st Concrete. A Middlesex County contractor was pouring a small sidewalk and needed about 3 yards of concrete delivered to Piscataway, NJ. He had used Quality 1st Concrete before, so he decided to call them to book the delivery. When he called their office, the Concrete Coordinator collected all the information needed for the delivery and got him on the calendar. Carlos, Senior Concrete Specialist, was out to make the delivery. Carlos loaded his truck with enough material to make 3 yards of concrete and began to drive over to the job site. When he was on his way, Carlos contacted the contractor to inform him that he was on his way to the job site. When Carlos arrived, the sidewalk was already framed out, and the crew was ready to start the pour. The truck was parked in the front of the house, the chute was extended out, and it was placed right over the sidewalk. Fresh concrete was mixed right there and then an was poured directly into the sidewalk area. Mixing the concrete on site offers more flexibility and better quality. The crew at the site floated and finished the concrete as it was being poured. Once all the concrete was taken out of the truck, the chute was rinsed out to ensure quality. At the end of the pour the contractor was able to remit payment directly to the driver using a credit card. The job was successfully completed, and the contractor was very pleased with the service provided by Quality 1st Concrete. A contractor in Middlesex County was pouring a slab for a customer in Highland Park, NJ and needed concrete to be delivered. He had ordered concrete from Quality 1st Concrete before, was very pleased with the service, so he decided to contact them again to schedule a delivery. When he called their office, the Concrete Coordinator easily located his file, and collected all the information needed for the new delivery. Sean, the Field Supervisor, was in charge of making the delivery. Sean prepped his truck the night before and made sure that everything was set for the next morning. The day of the delivery, Sean contacted the contractor to inform him that he was on his way to the job site. When he arrived, the crew was ready to start the pour and the slab was nicely framed. The chute was extended out and placed right above the slab area. Fresh concrete was mixed for them right there and then offering more flexibility and better quality. The levers on the concrete truck were used to move the chute along the slab to make sure that the entire area was covered in concrete. Once all the concrete was out of the truck, the chute was washed out to ensure quality. The pour was completed and the contractor was able to remit payment directly to the driver using a check. The job was a success, and the contractor was very pleased with the service provided by Quality 1st Concrete. 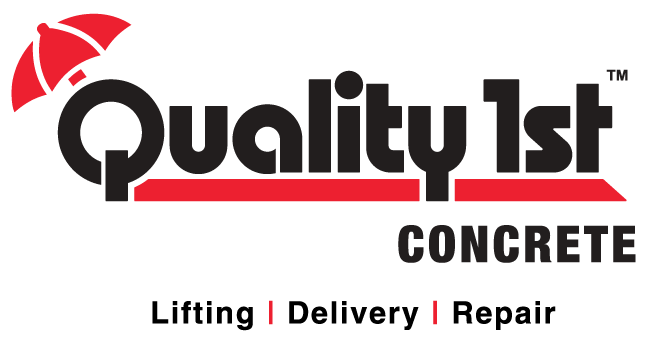 Our Contracting division, Quality 1st Contracting, has been replacing concrete for communities and commercial properties for over 20 years. They were replacing sidewalks at a community is Sayreville, NJ and needed concrete to be delivered. They needed about 20 yards of concrete, so the Contracting Coordinator placed the order with Quality 1st Concrete. Carlos, Senior Concrete Specialist, was in charge of making the delivery. The first truck was scheduled for 8:00 a.m. so Carlos fully loaded his truck, and made his way over to the job site. When he was on his way, Carlos contacted the site Foreman to provided him with an estimated time of arrival. Carlos arrived to the property and parked the truck right in front of the framed out sidewalks. The crew was ready to start the pour so fresh concrete was mixed for them right there and then. The chute was moved along the sidewalk to make sure that the entire section was covered with concrete. As the concrete was being poured, the crew members floated and finished the concrete. After all the concrete was taken out of the truck, the chute was rinsed out to ensure quality at the next delivery. The first 10 yards of 4500 PSI concrete were successfully delivered. Carlos drove back to the concrete plant, reloaded his truck, and brought the second delivery over to Sayreville, NJ. 20 yards of concrete were delivered in a timely manner. The job was completed, and our Contracting Division was very pleased with the service provided by Quality 1st Concrete. A contractor in Iselin, NJ was pouring a slab for a shed and needed about 2 yards of concrete to be delivered. He had used Quality 1st Concrete before so he decided to call them to schedule the delivery. When he called their office, the Concrete Coordinator easily located his file, saw that a previous delivery had been made at that property, and went ahead and scheduled the pour. Jay, Senior Concrete Specialist, was in charge of making the delivery. The morning of the pour, Jay contacted the contractor to inform him that he was on his way to the job site. When Jay arrived, he parked the truck and got out to introduce himself. The contractor showed him the area that was being poured, so the truck was moved to get closer to the shed. The chute was extended out and placed right about the framed out area. Fresh concrete was mixed right there and then offering more flexibility and better quality. The concrete was poured directly into the slab and the crew at the site took care of floating and finishing the concrete. After the pour was completed, the chute was rinsed out this way it would be ready to be used at the next delivery. 2 yards of 3500 PSI were successful delivered. The job was done in a timely manner, and the contractor was very pleased with the service provided by Quality 1st Concrete. A contractor in Monmoth County was pouring sidewalks for one of his customers and needed concrete to be delivered to Old Bridge, NJ. He was looking for a local contractor to come out and make the delivery, so he he went online searching for one. He came across the Quality 1st Concrete website, saw that their plant was located in Momoth County, and decided to give them a call. When he called their office, the Concrete Coordinator provided him with a price over the phone and scheduled the delivery for him. Jay, Senior Concrete Specialist, was in charge of making the delivery. The contractor needed about 16 yards of concrete, so Jay loaded his truck and made his way over to the job site with the firs 10 yards. When he was on his way, Jay contacted the contractor to provide him with an estimated time of arrival. When Jay arrived, he parked the truck and got out out introduce himself. The area that had to be poured was nicely framed out and the crew at the site was ready to go. Jay began to mix fresh concrete right there and then. Mixing the concrete at the site offers more flexibility, better quality, and the risk of wasted material is eliminated. The concrete was poured directly into the sidewalk avoiding the use of wheelbarrows. The first 10 yards were successfully delivered. Jay drove back to the concrete plant, reloaded his truck, and brought the additional 6 yards that the contractor needed. 16 yards of concrete were delivered in a timely manner. The job was well done, and the contractor was very pleased with the service provided by Quality 1st Concrete. A contractor in Middlesex County was pouring a sidewalk and was looking for a few yards of concrete to be delivered. He had used Quality 1st Concrete before so he decided to call them to schedule the pour. Quality 1st Concrete had delivered at the job site before, so when the contractor called their office the concrete coordinator located the job site address and scheduled the pour. Sean, the Field Supervisor, was assigned to make the delivery. The morning of the pour, Sean loaded his truck and contacted the contractor to provide him with an estimated time of arrival. When Sean arrived, the sidewalk area was already framed and formed out. Sean parked the truck right in front of the sidewalk and extended the chute. He began to mix fresh concrete and poured it directly into the framed out area. Mixing the concrete on site offers more flexibility and better quality. As the concrete was being poured, the crew at the site floated and finished the concrete. Fours yards of 4500 PSI were delivered in a timely manner. When the pour was completed the contractor was able to remit payment directly to the driver using his credit card. The job was a success, and the contractor was very pleased with the service provided by Quality 1st Concrete. A contractor in New Brunswick, NJ was pouring footings and needed concrete delivered. He needed about 10 yards of 3500 PSI and was looking for a local company to make the delivery at an affordable price. He called a few places around the New Brunswick, NJ area to get quotes and information. Going through Facebook he came across Quality 1st Concrete, liked their page, and gave them a call. When he called their office, he was very pleased with the customer service and the price of the concrete so he went ahead and booked the pour. Jay, Senior Concrete Specialist, was sent out to make the delivery. Jay fully loaded his truck with enough material to make 10 yards of concrete and made his way over to the jobsite. On his way there, Jay contacted the contractor to introduce himself and provided him with an estimated time of arrival. Once at the site, Jay was able to back up to the footings. He extended the chute and began to mix fresh concrete right there and then. The concrete was poured directly into the footings avoiding the use of wheelbarrows. The concrete was delivered in a timely manner and when all the concrete was out of the truck the chute was rinsed to ensure quality. The contractor was able to remit payment directly to the driver and got a receipt for his purchase. The delivery was a success and the contractor was very pleased with the outstanding service provided by Quality 1st Concrete. A Contractor in Middlesex County was pouring a foundation and needed about 20 yards of concrete to be delivered to South Plainfiled, NJ. The contractor had used Quality 1st concrete before, so he decided to call them to schedule the pour. When he called their office, the Concrete Coordinator easily located his file, collected all the information needed for the delivery, and got him on the calendar. Jay, Senior Concrete Specialist was out to make the delivery. The first truck arrived at 8:00 am to start the pour. The crew at the site was ready to go, so fresh concrete was mixed for them right there and then. The chute was extended out all the way, and the extension chute was used to reach the area that had to be poured. The concrete was poured from the original chute to the extension, making it easier for the contractor to work the concrete. After all the material was taken out of the first truck, the chute was rinsed out to ensure quality. Jay drove back to the plant, reloaded his truck, and brought the additional 10 yards that the contractor needed. At the end of the second pour, the contractor was able to remit payment directly to the driver using a check. The job was successfully completed, and the contractor was very pleased with the service provided by Quality 1st concrete. A contractor in Middlesex County was pouring a small sidewalk and needed concrete to be delivered. They were looking for a concrete supplier to make the delivery at an affordable price so he went online looking for a supplier. He came across the Quality 1st Concrete website and decided to give them a call. When the contractor contacted their office, the Concrete Coordinator provided him with a price over the phone and collected all the information needed for the delivery. Sean, the Field Supervisor, was in charge of making the delivery. He loaded his truck with enough material and made his way over to the job site. When he was on his way, he contacted the contractor to provide him with an estimated time of arrival. Once at the job site, Sean parked his truck right in front of the sidewalk. He extended the concrete chute out and began to mix fresh concrete. Mixing the concrete on site offers more flexibility and better quality. The concrete was poured directly into the sidewalk avoiding the use of wheelbarrows. As the concrete was being poured, the crew at the site floated and finished the concrete. At the end of the delivery, the contractor was able to remit payment directly to the driver. The job was completed in a timely manner, and the contractor was very pleased with the service provided by the Quality 1st concrete team.